I know many people are skeptical of mail ordering plants. I'm a plant person and I've gotten my share of crushed, broken plant orders, so I know how heartbreaking it can be. I just had an order for a square of moss and my 3-pack heirloom tomato bundle, and I took a few snaps during my packing process. I have had excellent luck with this method, knock on wood, and no broken plants to date. 1. 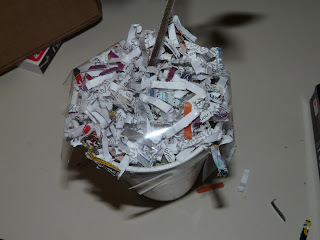 First, I cover the surface of the container with shredded paper and tape it down. 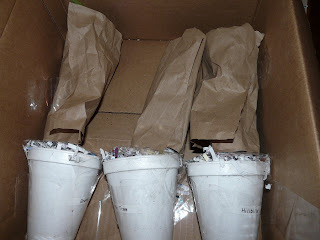 The shredded paper gives a soft cushion for the base of the plant and also prevents the soil and rootball from falling out of the container. 2. Then I take the container and tape it to the bottom of the box. I use three pieces of tape, minimum, to make sure that the plant is secured well. As you can see from the above picture, the plants are very well secured and even flipping the box over doesn't cause any noticeable shifting of the containers. No shifting means no broken plants. 3. 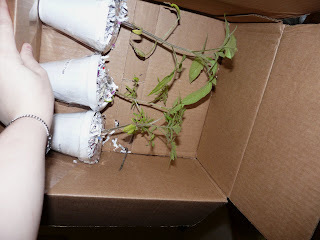 Once the plants are taped into the box, I wrap the foliage of the plants in paper. This prevents dessication and also keeps the packing materials from getting so tangled up in the leaves. 4. Pour in the peanuts! In smaller packages, crumpled paper is easiest and safest. For larger packages, peanuts are sometimes easier and create the least amount of pressure on the plants. This is why I chose to sell succulents they ship so easy! Thanks so much for this info. 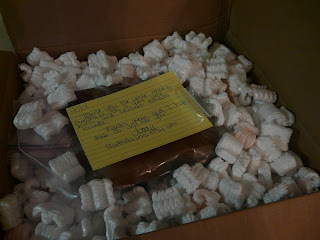 I've been trying and trying to think of how to safely ship plants and terrariums. I never would have thought to tape them to the box. Great idea.